Not since the glory days of the venerable muscle car era has power taken such centre stage at the North American International Auto Show. Real power in real cars, not just the concept and dream cars. Chevrolet revealed its 500 horsepower (that's right, five hundred brake horsepower) Corvette Z06, which itself was the thundering answer to the 500bhp Dodge Viper SRT10. Not to be left out of the spotlight, Jaguar revealed what is perhaps the most beautiful car ever out of Coventry - the all new Advanced Lightweight Coupe. If you want to know what the future holds at Jaguar, this car is the answer. Trucks continue to dominate the scene as Detroit battles it out with an ever expanding list of rivals from Japan. Honda and Mitsubishi both revealed production pickup firsts, with products that are already a threat to the established models from Ford, Chevrolet and Dodge. At the show in Detroit carmakers certainly were pushing the limit of the definition of "concept". Some of the so-called concepts introduced at this year's Detroit show, like the Saturn Aura, Audi Allroad Quattro, or Mazda MX Crossport, are really just thinly disguised production vehicles that are well on the way to being launched as a production car. Strip off some of the gratuitous fake chrome, narrow the exaggerated wings, and reduce the wheel diameters by a few inches, et voila! Guaranteed something eerily similar will magically appear in a showroom near you. One of the reasons for this recent trend is that most manufacturer line-ups are now fairly complete. Five or six years ago every vehicle segment had not been "busted" yet. Today, the public's pulse on niche products has been thoroughly taken. Although I'm still waiting for a seven- seat, all-wheel-drive convertible with a built-in snowplow, but that's just me. With the dearth of any truly "conceptual" vehicles, the focus at the 2005 Detroit show seemed to have been on cars that we will be able to purchase sooner rather than later. Despite the buzz about "real" cars making a comeback in 2005, there were still plenty of new production SUVs announced. Cars like the Range Rover Sport, Saab 9-7X, and Mercedes M-class ensure that every infinitesimal niche in this already crowded segment will eventually be filled. Ironically, Mercedes' Smart booth, which was brimming with folks trying out the not-for-sale-in-America Smart ForTwo and Roadster, was positioned directly across from the Mitsubishi booth, which was drawing crickets. This despite Mercedes putting on hold plans to launch the micro-cars in the American market. Hmmm, maybe they should rethink that one. The 2005 North American International Auto Show (NAIAS), one of the world's most prestigious automotive events, expects to showcase more than 65 exciting new vehicle introductions. The Detroit Auto Show is premier venue for manufacturers worldwide to reveal their production and concept vehicles, and for the world to get a first-ever glimpse of the hottest automotive trends in SUVs, trucks, sport cars and luxury vehicles (Note from Ed: notice the order these vehicles are listed in - telling for the US market in particular). The 2005 Detroit Auto Show dates for the Media Preview are January 8 - 12, 2005, the Charity Preview is January 14, and the Public Days are Saturday, January 15 - Sunday, January 23, 2005. The Car Enthusiast will provide in-depth coverage from the show floor, including images of the hottest vehicle reveals and interviews with top industry leaders,. Bill Cook, senior co-chairman of the NAIAS 2005 said, "From our discussions with the automotive manufacturers and news reports, we've learned that this year's NAIAS is going to be yet another banner year featuring exciting new automotive products and technologies from nearly every industry category." - BMW 5-series AWD - an all-wheel-drive version of BMW's midlevel 5-series sedan. - Cadillac STS-V - a performance version of Cadillac's flagship STS sedan, redesigned for 2005. - Chevrolet Corvette Z06 - 500-horsepower performance version of the sixth-generation Corvette, redesigned for 2005. - Dodge Charger - the return of a legendary name from the muscle-car era on a HEMI-equipped, rear-drive, five-passenger saloon. - Ferrari Superamerica - a 12-cylinder convertible version of the 575M Maranello coupe that was designed by legendary Italian design house and perennial Ferrari partner, Pininfarina. - Ford Fusion - Ford's new midsize car for the US (not to be confused with the European Fusion, which is basically a tall Fiesta). 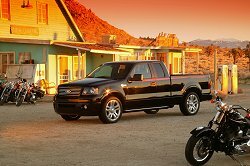 - Ford F-150 Harley - a Harley-Davidson version of the F-150 pickup truck. 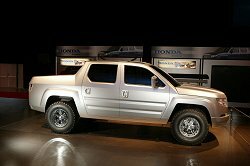 - Honda Ridgeline - Honda's first-ever pickup truck. - Infiniti M45/M35 - two new luxury/performance sedans to slot just beneath the flagship Q45. - Kia Rio - a completely redesigned entry-level saloon that's bigger and more powerful than the current model. 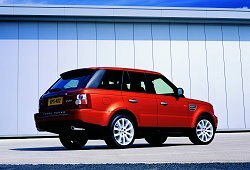 - Land Rover Range Rover Sport - a completely new sport utility vehicle and a fifth nameplate for the brand, slotting between the LR3 and Range Rover. - Lexus GX 470 - a luxury utility with more performance and technology. - Lincoln Zephyr - a new entry-level luxury saloon for Ford's luxury division. - Lincoln Mark LT - a luxury vehicle that combines a sport utility vehicle cabin with a pickup bed. 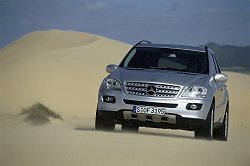 - Mercedes-Benz M-class - a redesign of the Alabama-built M-class sport utility vehicle introduced eight years ago. - Mitsubishi Eclipse - all-new, more powerful fourth generation of this popular sporty coupe. - Mitsubishi Raider - Mitsubishi created unique styling inside and out for this midsize truck based on the Dakota. - Saturn Sky - a new two-seat, rear-drive sports roadster. - Subaru B9 Tribeca - the first Subaru 7-passenger vehicle. - Toyota Avalon - a completely restyled full-size saloon with more performance and luxury. - Porsche 911 Carrera, Carrera S Cabriolet - convertible versions of the redesigned 911. - Chrysler Firepower - an elegant grand tourer riding on the Viper chassis and powered by a 6.1-litre version of the Hemi V8. - Ford Explorer Sport Trac - a concept that signals the next-generation version of the sport-utility vehicle with a pickup bed. - Infiniti Kuraza - an exploratory look at future sport utility vehicle interior design. - Jeep Gladiator - a Jeep pickup. - KCD II - the second concept vehicle from Kia's California design centre is a rugged sport utility with three rows of seats. - Lexus LF-A - exotic sports car concept vehicle. - Mercury Meta One - a rolling showcase of promising active safety technologies. - Nissan AZEAL Coupe - a fresh interpretation of the "pocket rocket" - an affordable, high-performance, entry-level coupe with an emphasis on personality and aggressive styling. - Saturn Aura midsize saloon - a new entry into the midsize saloon segment for the GM division. - Suzuki Concept X - Suzuki's first-ever midsize sport-utility vehicle concept. - Volvo 3CC - an innovative and stylish environmentally friendly car with three seats and powered by lithium-ion batteries. - Aston Martin Vanquish S V12 - the fastest-ever Aston Martin. - Audi A6 Avant - the estate version of the redesigned A6. - BMW 530xi - the 5-series Sport Wagon combines the performance of a car with all-weather confidence. - Hyundai Sonata - the first vehicle to be produced at the new Hyundai plant in Montgomery, Alabama. - Mercedes-Benz Grand Sports Tourer Vision B - first shown in Paris, a compact sports tourer with compact exterior dimensions, but roominess inside. - Rolls Royce 100EX - this experimental car from Rolls Royce, the inspiration for a 2007 convertible, celebrates Rolls Royce's centennial. Entering its 17th year as an international event, the North American International Auto Show is one of the largest media events in North America. The NAIAS is the only auto show in the United States to earn the distinguished sanction of the Organisation Internationale des Constructeurs d'Automobiles, the Paris-based alliance of automotive trade associations and manufacturers from around the world. Details will be added as we receive them. In the meantime feel free to browse the stories and image galleries below. Audi's new SUV, based on the Pike's Peak concept from the 2003 Frankfurt Motor Show, will be badged Q7 when it reaches the market place in 2006. Set to go head to head with the Porsche Cayenne and AMG ML, the Q7 is said to offer all the advantages of an off-roader but with the dynamic excellence of an Audi sports saloon. Expect to see it at the 2005 Detroit Show. The Drophead Coupe is the final iteration of the Bentley Arnage before it is replaced with an all-new Continental GT based car. The car shown at the 2005 Los Angeles Show is a concept to gauge customer reaction. It is likely to be made though. The men and women of the M division have earned a big Christmas bonus. The BMW M6 is the second major M-car this year. The BMW M5-challenging Cadillac STS-V caught John LeBlanc's eye in Detroit. The latest generation Corvette is pretty good, but now there's a 7-litre Z06 version to rival the Porsche 911. Could it? 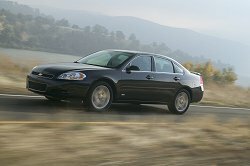 A full image gallery of the 2005 Chevrolet Impala SS and Impala LTZ is online now. The cars debuted at the 2005 Los Angeles Auto Show. A full image gallery of the 2005 Chevrolet Monte Carlo SS is online now. 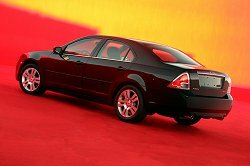 The Monte Carlo debuted at the 2005 Los Angeles Auto Show. Blatant styling plagiarism aside, the Firepower is a sound sports GT. Chrysler has released teaser shots of its Firepower concept to be shown at the 2005 Detroit Motor Show. 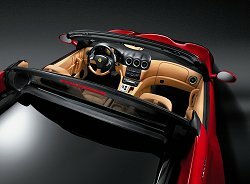 Ferrari will show the limited edition Superamerica at the 2005 Detroit Motor Show. We have initial details. James Jenkins peers into the new open-top Mustang from Ford. We don't like the SYNus concept, but you might, so here are all the details, in Ford's words. A convertible version of the new Ford Mustang was inevitable, and here it is after its launch at the 2005 Detroit Show. The Mustang Convertible looks just as good as the coupe, dripping desirability and no doubt will be at a great price too, well for US buyers anyway. Just what the world needs - another fast pick-up truck... Image gallery of Ford's Explorer Sporttrac concept is online now. The US car makers are surely quaking in their cowboy boots at the sight of Honda's Ridgeline. 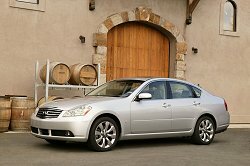 The Infiniti M-series should prove to be a decent rival for the Germans in the US market, but we don't expect to receive it in the UK just yet. Pity. Jaguar wowed the crowds in Detroit with the unveiling of the rather special Advanced Lightweight Coupe - obviously a thinly disguised replacement for the XK. Jeep will show the Gladiator at the 2005 Detroit Auto Show. Based on the evergreen Wrangler, the Gladiator has been tagged as a "Flexible Utility Truck." 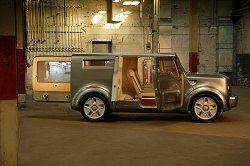 It features a canvas top and an expandable truck bed. Didn't Honda do that last year? No doubt it will go into production to compete against the new Honda Ridgeline, and will sell well in the US only. 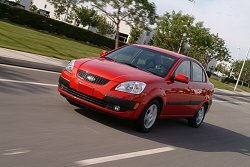 The new Kia Rio was shown in Detroit in four-door form. It will reach the UK in the summer as a five-door. In the UK at least, Kia's Rio has been a bit of an oddball. We drove it and thought it was a bit of old-fashioned (and exceptionally good value-for-money) fun, though most of you will probably only remember that the Rio could be 'bought' for £1. Surprisingly, the replacement shown at the Detroit Show is positively mainstream. Following the debut at the Detroit Auto Show, Land Rover has released official pricing details for the new Range Rover Sport model. The basic 2.7-litre TDV6S comes in at £34,995 and includes the Terrain Response system, 6-speed adaptive gearbox and air suspension as standard. The range topping supercharged 4.2-litre V8 HSE is £57,485 and features include satnav, a Harman Kardon sound system and 20-inch rims. Big brother Range Rover couldn't let the Sport have all the fun now could it? Supercharged super-SUV lets loose in Detroit. Not to be outdone by its sporty new brother, the Range Rover will also receive a major overhaul at the Detroit Show. The styling is revamped to look more like the Sport and finally the engine range has been replaced with Jaguar units. Image gallery online now. Land Rover caused a stir at the 2004 Detroit Motor Show when the stunning Range Stormer concept stole the show. It was obvious that some of the more outrageous details would never make production, but the basics were in place for the launch of a new high-performance Land Rover. The sharp Lexus LF-A concept shown in Detroit could spawn a new Porsche 911 rivalling sportscar. Mazda will display its Crossport concept at the Detroit Show, previewing the next important model to come from the Japanese maker. We have an initial gallery of photographs before full details are available. Should BMW and Range Rover lose sleep over the new Mercedes M-class? It promises to be better in every respect, and goes on sale next year. The Mercury Meta One crossover concept holds several new key safety features. It will be shown in Detroit. John LeBlanc reckons that the new Mitsubishi Eclipse debuting at the 2005 Detroit Show is retro - if the '90s can be retro already. Mitsubishi entered the LA Show Design Challenge with The Ultimate Evolution: an advanced crossover vehicle attempting to be all things to the average LA dweller. A full image gallery of the 2005 Pontiac G6 is online now. The G6 GTP and G6 hardtop convertible both debuted at the 2005 Los Angeles Auto Show. A full image gallery of the 2005 Pontiac Torrent SUV is online now. The Torrent debuted at the 2005 Los Angeles Auto Show. We like the new Saturn Sky lots. Please Vauxhall, put your badge on it and sell it to us. Saturn's Sky two-seater sportscar will be revealed at the 2005 Detroit Auto Show. Given that there is already a production cabriolet version of VW's New Beetle on the market, it was quite surprising to see the cool Ragster concept turn up at the Detroit Show this year. Though it is unlikely to go into production, look closer and we could be seeing details of the next Beetle facelift: the rear lights and the sharpened wheel arches in particular caught our attention. Volvo's 3CC concept car has it all: good looks, new safety and propulsion technologies, and an innovative layout. It also hints at a new small coupe from Volvo.